A historically black church located just outside Charleston, S.C., and which was burned to the ground 20 years ago by the Ku Klux Klan, was ablaze Tuesday evening. 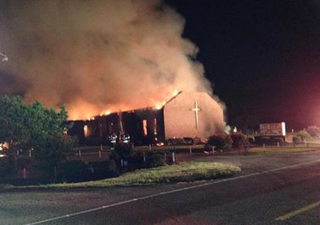 According to WACH Fox 57, the Mount Zion African Methodist Episcopal Church, located in Greeleyville, S.C.—about an hour away from Charleston—burned well into the evening as two fire crews from different counties battled to get the flames under control. The news station noted that at one point, the flames could be seen shooting through the roof of the more than 100-year-old church. Williamsburg County Sheriff Dudley Musier told the news station that the fire started around 8:35 p.m. Tuesday. "We're going to continue to investigate what caused this fire. Right now it's still fresh; we don't know what caused it," Musier told WACH. At least five fires at black churches have been reported in recent weeks since the June 17 massacre of nine African Americans at the Emanuel African Methodist Episcopal Church in Charleston, S.C. According to the Washington Post, three of those five fires were reported as arson. Tuesday's fire wasn't the first time that the Mount Zion church and the community has had to deal with a costly blaze. On June 20, 1995, two former members of the KKK set Mount Zion on fire, the Post reports. The church was rebuilt and reopened in 1996. Then-President Bill Clinton toured the newly rebuilt church and presented Mount Zion Pastor Terrance G. Mackey with a plaque that read, "We must come together as one America to rebuild our churches, restore hope, and show the forces of hatred they cannot win," the Post reports. The news station reports that investigators from the state Law Enforcement Division; the Bureau of Alcohol, Tobacco and Firearms; and the FBI spent all night at Tuesday's fire scene and will hold a joint press conference at 10 a.m. Wednesday. South Carolina state Rep. Cezar McKnight, who spent most of the evening at the scene, told the news station that unfortunately, the community has learned how to handle tragedy. "Draw your strength from the Lord, come together as a community and meet whatever adversary you may have with the spirit of love," he told WACH. "So I think this community has done that in the past and they will do that now." Read more at WACH Fox 57 and the Washington Post.